What does Om have to do with yoga and meditation? The three components often go hand in hand as practitioners learn to put together their skills and relaxation. Articles in Time Magazine and USA Today report that meditation helps people to increase attention and memory, even avoiding the natural loss of these abilities. Om is considered the original word of power and the most sacred of holy words. The Colors of India website notes that according to legend, the world was created out of a thought: "I am only one - may I become many." The Brahman thought this, and this thought became a vibration. That vibration became a sound, Om. Om is considered to be the supreme mantra. It can also be spelled out as Aum - both are considered correct, but most people find Om preferable because of the issue of pronunciation. The "O" is meant to be pronounced as the long "O" sound, as in "home" and "lone." Be careful to pronounce it correctly. To many people, it is the basis of all sound in the universe. The symbol, as written in Sanskrit, represents the world and everything in it. The large curve in the lower section is representative of the material world in its waking state. The upper left curve shows the sleeping state. The middle represents the dream state. The point and semicircle are seen as separating and ruling. 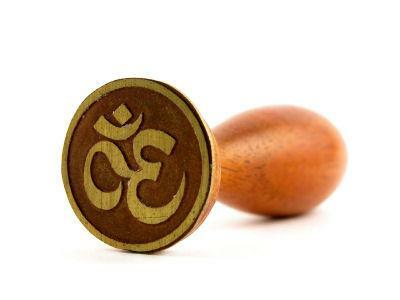 Om is used as a mantra or chant. It is meant to be used in meditation and daily life. Chanting Om, according to believers, will give you a sweet voice, keep you from being depressed, remove distractions and worldly thoughts, and give you power. It is suggested that you chant it as you walk, or sing it whenever you begin to feel unhappy. The full mantra that most people use is Om Mani Padme Hum. This mantra cannot easily be translated into English. According to Dilgo Khyentse Rinpoche, the author of The Heart Treasure of the Enlightened Ones, "There is not a single aspect of the 84,000 sections of the buddha's teachings which is not contained in Avalokiteshvara's six syllable mantra." The mantra appeals to Chenrezig, the Buddha of Compassion. When this mantra is recited, the believer thinks of himself or herself as Chenrezig in hopes of receiving the enlightenment from within and, in effect, giving him or herself love and compassion. Chanting this manta is meant to help the yogi to reach a state of awareness in which he or she understands how to avoid suffering. Om yoga is also called Pravana yoga. It is a form of yoga that includes a focus on breathing, meditation, and the chanting of a mantra. According to believers, practicing this type of yoga will help to unlock the self and become free. Omsakthi, which has a section on meditation. Atma Jyoti Ashram, which contains information on yoga, meditation, and breathing. Our voices have power. To use an exclamation that promotes unity and peace allows you to create a sacred space within yourself that will reach out in a positive way to others around you.